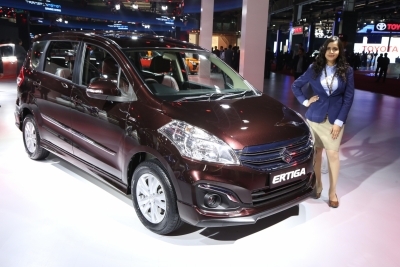 Mumbai, Nov 21 (IANS) Automobile major Maruti Suzuki India on Wednesday launched the next generation of its multi-utility vehicle 'next gen Ertiga'. According to the company, the new vehicle's petrol powered version is priced between Rs 7.44 lakh and Rs 9.95 lakh while the diesel fuelled variant costs between Rs 8.84 lakh and Rs 10.90 lakh. The company said a new 'K15' petrol engine provides 13 per cent more power and six per cent improved torque output. "Complementing the new engine is the 'Progressive Smart Hybrid' technology with a 'Lithium ion' battery which offers best-in-class fuel efficiency," the company said in a statement. "The latest offering from Maruti Suzuki is conceptualised on Suzuki's acclaimed 5th generation 'Heartect' platform. Built afresh, it uses high tensile steel that ensures stronger, safer and sturdier structure with effective absorption and dispersion of crash energy." As per the statement, Maruti Suzuki and its suppliers have invested over Rs 900 crore towards development of the 'next gen Ertiga'.